February 11, 2019. 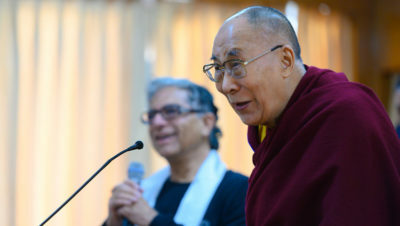 Thekchen Chöling, Dharamsala, HP, India – Indian-born American author and public speaker Deepak Chopra and 45 close friends met His Holiness the Dalai Lama this morning. His Holiness welcomed them saying: “We’ve met a few times before, but now I’m happy to be able to welcome you here, my spiritual brothers and sisters, to what has been my home for the last nearly 60 years. “In today’s world, despite extensive material development, we face all kinds of problems. Natural disasters are beyond our control, but fighting and killing are things we could put a stop to. However, we pay too much attention to material goals and not enough to human values like love. Many of the problems we face are of our own creation and yet scientists tell us that basic human nature is compassionate. They also tell us that cultivating a compassionate attitude is good for our physical health, while constant anger and fear undermine our immune systems. In answering questions from the group, His Holiness explained that just as we can’t assert that one medicine is best for everyone, because what is required will depend on the patient’s age, condition and ailment, we can’t state that a particular religious tradition is best. Different people may find different traditions and practices more effective for them. Tibetans follow the Nalanda Tradition which means they study the works of various masters and he indicated the figures depicted in paintings hanging around the room. They analyze and investigate contrasting points of view, which deepens their understanding. 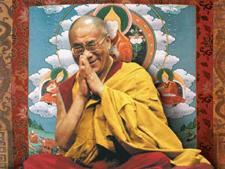 For the individual, His Holiness added, the important thing is to find a practice that helps tackle the destructive emotions. Asked to name a world leader he admired, His Holiness mentioned Mahatma Gandhi, who, despite his sophisticated education, returned to India where he dressed like an ordinary Indian and promoted ahimsa or non-violence during the freedom struggle. He also acknowledged Rajendra Prasad, first President of India and Willy Brandt who maintained contact with the Soviet Union even during the Cold War. Invited to explain how to be compassionate while being wronged, His Holiness recommended recognizing that we are all just human beings. He declared that he’d found such an approach of immense help in his own life. Whoever he meets he feels is just like him, someone he can regard as a brother or sister. When he thinks of Chinese officials in Tibet who have imposed hardship on Tibetans, he reminds himself that they too are human beings. As social animals, human beings depend on the community in which they live, which is why His Holiness emphasizes the importance of remembering the oneness of humanity. He went on to discuss non-violence and what a waste it is to dedicate talent and resources to developing, manufacturing and selling weapons. He recounted a meeting of Nobel Peace Laureates in Rome and being shocked by a description of the consequences should nuclear weapons be used. He immediately suggested that a timetable be set for their elimination, but nothing happened. Nevertheless, he said, it is essential not to give up the effort, not only on the level of leaders and organizations like the UN, but on an ordinary public level too. In the face of modern education’s predominantly material goals His Holiness recommended adding to instructions about physical hygiene advice about emotional hygiene and ways to tackle destructive emotions. Children can be taught to recognize that anger and fear ruin our peace of mind, while other destructive emotions disrupt family harmony. He noted that the ancient Indian understanding of the workings of the mind and emotions remains relevant and helpful on a practical level today. “In the early 20th century,” His Holiness added, “scientists only showed interest in learning about the brain as distinct from the mind. Gradually, some of them have come to recognize that there are different levels of mind—sensory waking consciousness, the consciousness of the dream state, the subtler awareness of deep sleep and so forth. Some meditators have experienced these different levels of mind in meditation, while scientists have begun to see how they affect the brain.